Madness and the ravings of the mad are themes that Lovecraft visits time and time again in his work. It’s a subject that is close to his heart. He himself having suffered a nervous breakdown in his formative years, as well as suffering most of his life from both parasomnia and pareidolia (sleep paralysis seeing faces in dark shadows). Indeed, a fair degree of his later work can trace its inspiration back to these afflictions. ‘The Tomb’ is one of his earlier works, and in it he used the device of a narrator of questionable sanity. That narrator, Jervas Dudley, makes no bones about this in his tale, telling us repeatably that his word is questionable. All the while talking about dalliances with dryads in the woods and ghosts in spectral masons. As well as his own belief that he is privy to a more mysterious world than most, alluding to having some form of second sight and a touch of the fay about himself. Written in 1917 when Lovecraft was at the very beginning of his publishing career, it was first published in ‘The Vagrant’ five years later. At a time when Lovecraft had begun to build a small but loyal following, at least in the pages of the small press pulp magazines. The question of the narrator’s sanity is an open one, though Lovecraft certainly pushes the idea that what society believes to be the ravings of a madman could hold more than a seed of the truth behind it. In typical languid prose, the narrator vouches what Kipling summed up more succinctly with, ‘There are more things in heaven and earth than are dreamt of in your philosophy.‘ A concept at the heart of much of Lovecraft’s work. This occasionally laboured prose is occasionally I find a problem with Lovecraft’s style. He will at times stretch a sentence around all kinds of strange geometry to say something in the least succinct way possible. Ironically this style is also something of the joy I find in reading Lovecraft, but it is easy to get lost in his sentences all the same. ‘The Tomb‘ is definitely a story of that kind, weaving long tracks through the woods, where shorter paths exist. There is, however, depth to that style which draws you in and gives voice to the narrator. Intentionally or not, these read like slightly deranged ramblings, wandering around his tale by strange roads and trails. It feels authentic the madness of the narrator, which is the real strength of the story. In fairness, as I am no stranger to the odd bit of meandering prose (my novel Passing Place has more than a few wandering narratives within it), as such, I am hard pressed to criticise Lovecraft for doing so. There have been several comic book adaptations of the story, which follow the plot to a greater or lesser degree, certainly closer than a movie in 2007 called ‘The Tomb‘ which was publicised as ‘HP Lovecraft’s The Tomb‘. It went ignominiously straight to DVD and had no actual ties to the Lovecraft story at all. It was instead a low budget movie following the same basic plot of the ‘SAW‘ films. It was not an overwhelming success though has some following with the director Ulli Lommel’s fans, its interest to Lovecraft aficionado is limited. As a tale within itself, ‘The Tomb‘ draws you along, in mild bemusement at the narrator’s wanderings. The hints of madness mixed with the obsessive are all there. Jervas Dudley, on one of his long fanciful walks through the woodland, comes across a locked tomb hidden in a grove. Below the remains of the Hyde family mansion, long burned down after a lightning strike, (struck down for the decadence of its inhabitants by the Lord above, as the local folk law would have it.) His obsession with the tomb, the family interred there and how it may connect to himself becomes a central part of his life and the story. When he later finds a porcelain figurine with the initials J.H upon it. in a box with a key he believes he has found the way into the tomb. Within he finds the coffins of the long dead, and one empty one, the right size and shape for himself. Whereupon he takes to sleeping within its dusty halls each night. Eventually, Jervas is undone, his nightly wanderings discovered, though those who discover his strange obsession are convinced he sleeps outside the tomb, and the padlock on the door has never been touched. Lovecraft leaves us with this. A story told by a man in an asylum, believed to be mentally unstable, telling us a tale that even by his own recounting of it leaves questions of its validity. This tale has long been a favourite, and one of the Lovecraft stories I have read before more than once. Its strength lays in its narrator, and the choice you are given to believe in all he says or believe instead this is merely a window into his insanity. It is in many ways the essence of a good Lovecraft short story, which explains the many ways it has bene re-envisioned by others since it was first published. 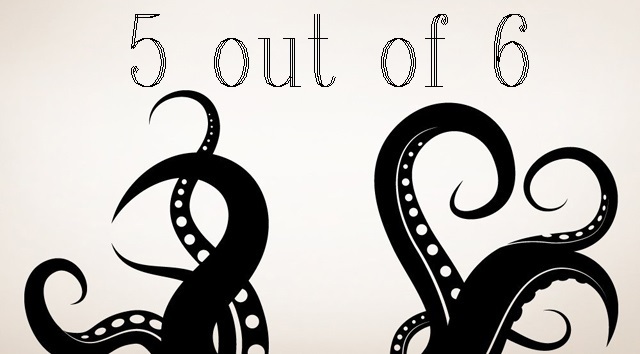 So I give it a madness inspired 5 out of 6 tentacles. This entry was posted in Lovecraft, retro book reviews, rites and tagged cthulhu, Lovecraft. Bookmark the permalink.